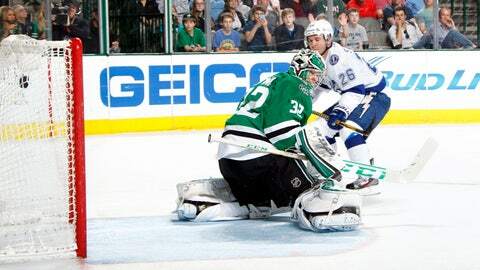 The Lightning's Martin St. Louis puts the puck past Stargs goalie Kari Lehtonen. Being the subject of trade rumors has not slowed down Martin St. Louis. St. Louis scored two goals for the second consecutive game to lead the Tampa Bay Lightning to a 4-2 win over the Dallas Stars on Saturday afternoon. The Lightning had lost five of their previous seven games, including a 3-2 loss to Nashville Thursday. Tampa Bay coach Jon Cooper said he wasn’t thinking about that game when Dallas cut a 3-0 second-period deficit to 3-2. The Lightning won despite being outshot 41-21. The 38-year-old St. Louis has been the subject of trade rumors, but with the Lightning fourth in the NHL’s Eastern Conference, they might not want to send away their scoring leader. ”That kid comes to play, and that’s what you want in a player,” Cooper said. ”And all this speculation of him being moved or asking for a trade, that doesn’t come into one spot of our locker room of trying to win a hockey game. Goalie Ben Bishop cooled off Dallas by making 39 saves for his 29th win. The four goals allowed by Stars goalie Kari Lehtonen were his most in 12 games, since a 4-3 loss to Colorado Jan. 27. He made 17 saves. The Stars, who had been 7-1-2 in their previous 10 games, remained eighth in the Western Conference. St. Louis scored just 1:25 into the game. Eric Brewer sent a shot from the slot wide right, but the puck hit St. Louis’ left leg and deflected into the near side of the net past Lehtonen. The Lightning had another chance on a 2-on-1 rush 7 minutes later, but Lehtonen deflected Ryan Malone’s shot away into the left corner. At 12:09, Thompson gave Tampa Bay a 2-0 lead by deflecting Hedman’s drive from the left point over Lehtonen’s left shoulder. That was the seventh shot on goal, equaling the Lightning’s total for the final two periods in Thursday’s loss to Nashville. Hedman earned his 100th career assist. Tampa Bay outshot Dallas 11-8 in the period. The Stars dominated the second period, outshooting the Lightning 18-7. However, Tampa Bay scored on St. Louis’ breakaway for a 3-0 lead at 14:31. Dallas intensified its pressure, and scored twice to go into the final period trailing 3-2. At 15:50, Roussel deflected Kevin Connauton’s shot from the left wing boards off Lightning defenseman Michael Kostka’s skate and past Bishop. Fiddler scored on a wraparound at 18:11. It was only the fourth goal for Fiddler and 10th for Roussel, who play on a defensive line with Ryan Garbutt. They combined for nine shots on goal Saturday. The Stars had chances while on a power play for the period’s final 22 seconds, but couldn’t score again. In the third, Fiddler’s line continued to pressure Bishop. He stopped good scoring chances by Fiddler and Garbutt early in the third. Salo extended Tampa Bay’s lead to 4-2. He took a pass off a faceoff in the neutral zone, skated in to the high slot and sent a slap shot into the top of the net. ”I think we kind of burst their bubble when we got that fourth one,” Cooper said. NOTES: Before Thursday, St. Louis hadn’t scored since a four-goal game Jan. 18. He has scored 29 times, with multiple goals in seven games. He has a five-game point streak (four goals, three assists, seven points). … Palat has at least a point in four consecutive games. … Dallas had outscored its previous 10 opponents 31-13. … The Lightning have a 5-0-2 record in the past seven games against the Stars. The teams hadn’t met in more than 2 years, since Tampa Bay’s 2-1 victory Jan. 20, 2012, in Dallas. … A puck sent into the Stars’ bench hit Ruff in the head, cutting him between his eyebrows. ”I’ve been hit harder. I have a small cut and a little headache,” he said … The Stars are 1-5-3 this season in games when they’ve had 40 or more shots on goal. . Dallas defenseman Brenden Dillon was inactive because of a lower-body injury.